To make this skirt, I am using Sew What! 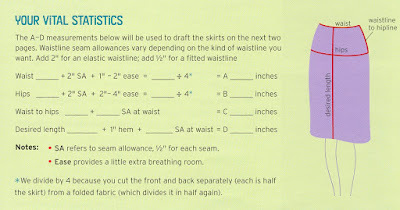 Skirts: 16 Simple Styles You Can Make with Fabulous Fabrics, and I’m following the book’s guide for drafting a pattern. And the pattern starts with calculations based on my measurements. 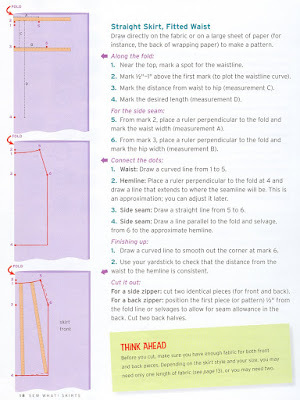 The first image is scanned from the book, and it’s how I derived the skirt dimensions. After I put away my calculator watch, it was time to draft the pattern. I followed the instructions in the above image. I only drafted one pattern piece. Cutting out the skirt front. Now it’s time to mix it up with the fabric! 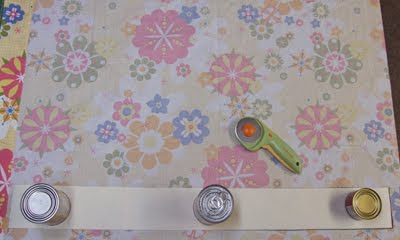 The fabric for my muslin, or test garment, by the way, is a Pottery Barn Teen flat sheet that I thrifted. I made a cute little purse out of it for a friend. But I digress. 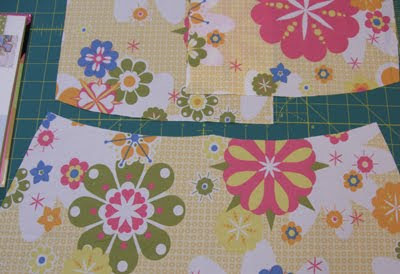 – If this were the final fabric, it would have been ironed it before I started cutting pieces. – If this were the final fabric, I would have been cutting on the wrong (inside) side of the fabric, and the pattern piece would have been backward. 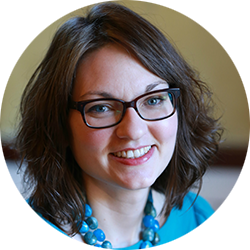 It’s crucial to PAUSE and THINK about what exactly you’re cutting out. 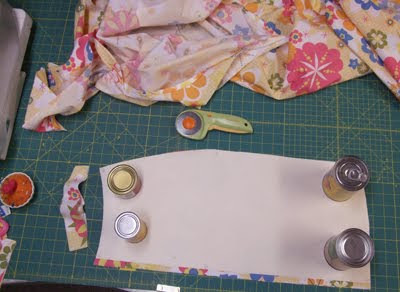 If you don’t flip your pattern piece, you’re putting the inside of the fabric on the OUTSIDE of the garment. And then the cursing starts, because maybe you didn’t buy enough fabric to cut another piece. Hey, I’m just saying. It’s happened to me. The front part of the skirt is cut on the fold. (This means I cut around three sides of the pattern but not through the fold.) The pattern piece is essentially one half of the front piece. Unfold the cut front piece, and ta da! I have one piece of fabric. 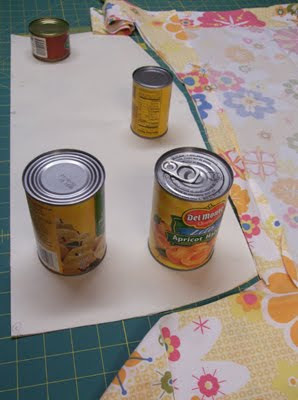 When I’m cutting larger pieces, I like to use weights, such as canned foods, to hold down the pattern. Adding one-half inch for the seam allowance in the center back. The next step was cutting out the two back pieces. But before I could put rotary cutter to fabric, I needed to add one-half inch to the width of the pieces for the center seam. I marked the addition on the right side of the fabric with pen. If this were the real fabric, the markings would have been on the inside with chalk or fabric marker. But this is my practice skirt, and I’m playing it fast and loose. Wahoo! Cutting out the skirt back. 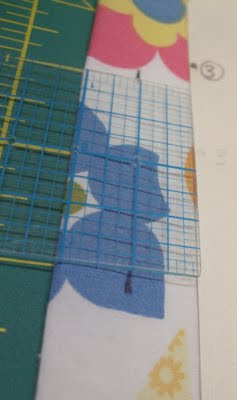 The two back pieces were made by cutting on all four sides of the pattern piece (i.e., cutting THROUGH the fold that connected the front piece = two pieces instead of one piece). I noticed after I laid out my pattern pieces that the front piece had a bit of a scallop at the fold. I can even that out when I attach the waistband. The next step is figuring out how to install an exposed zipper — a new technique for me.